As a fledgling writer, it's always fun to read the reviews that my writing receives. Sometimes, I'd rather not, but I find as someone starting out that people generally say nice things when they can. 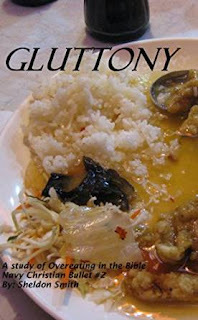 I was overjoyed when I read a recent review of Gluttony: A Study of Overeating in the Bible, which is the second Navy Christian Bullet. Here is the reviewer's remarks: "Honest and sound advice. Many good strategies to put into practice. Perfect use of scripture for application. Hard topic but well done!" The reviewer gave me five stars too! I don't pay reviewers to look at my work, so while I don't know G. Davis, I'm grateful for the review. I'm also grateful that my writing has helped someone and that they have gleaned useful information from my work. If you're struggling in the fight against gluttony, or otherwise unhealthy eating habits, please pick up a copy of Gluttony: A Study of Overeating in the Bible today! I think it will help you as much as it helped my reviewer.